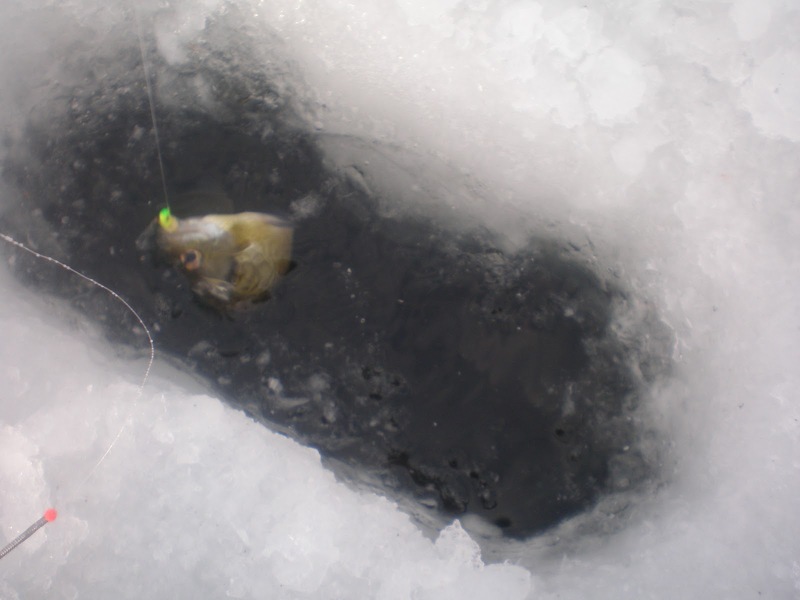 Fighting a slab bluegill on light tackle can be one of the best experiences an ice fisherman can have. Pound for pound, these little guys can fight with the best of them. I have caught big gills that have fought just as hard as a smallmouth bass. Fishing for bluegills can be a sport enjoyed by the young and old. It doesn't take a lot of equipment or expensive lures to get out and target them. Because of the simplicity of the tackle, most people think bluegill fishing will be easy. However, this is not always the case. Most beginners don't usually go out their first time and hammer the fish. I have been fishing for bluegills for a couple of years and would like to share some of the tactics I utilize. Like most other types of fishing, I always start by trying to find some weeds. This is especially important when fishing in a lake with a lot of predator fish. Bluegills will hang out in the weeds to keep themselves hidden from pike and walleye. Once you locate some weeds, the next step is to get the bait in front of the gills. I always use a depth finder to make sure my bait is at the bottom of the lake. I will fish at the bottom of the lake for awhile before moving my bait higher up in the water column. Once I catch a fish at a certain depth, I will pinpoint that level. If I catch multiple fish at that same level, I have found the pattern. If the bite dies down, I will make sure my bait hasn't moved out of the original depth. When I get my bait back to the sweet spot, I will start catching fish again. I believe the oxygen levels of the lake has a lot to do with where the fish hover. Depending on the factors of the lake and the day, the oxygen level could be higher at different depths. Since oxygen is at a premium during the winter months, the fish will be where they can find the highest amount. Once I figure out the correct depth to catch fish, I will put my bait at that depth and not touch it. 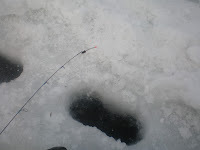 I like to put the rod on the ice and sit back and watch for bites. I like to use a panfish popper rod because it has a bobber built into it. Once the bobber goes down, I will grab the line with my hand and set the hook. Instead of using the reel to bring the fish up, I will hand-line the fish up out of the water. I do this so I don't lose the depth that my jig was at. Once the fish comes out of the hole, I unhook the fish, and throw the jig right back in the water and start the process again. Once the bite slows down, try a different depth or hole. Most of the time, you will catch one or two fish at a different depth and then nothing. This is the time to go to a different hole. If you have had luck for awhile at one hole, do not venture far from it. Try another one that is 10-20 feet away. If you don't get any action, make a circle around the original hole until you start hitting fish again. Once the action dies down again, go back to the original hole. Most of the time, the fish will have moved back in.